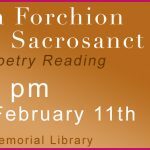 Join us at Brooks Memorial Library at 7 pm on Monday, February 11th as William Forchion reads from his book Sacred & Sacrosanct: a collection of poems! Wiliam is a Director, Producer, Poet, Clown, Acrobat, Stuntman, Father, Friend, Minister, Coach, Writer, and Teacher, all in one package. 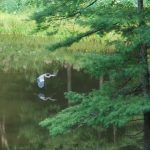 His works have been called “resonant” and “insightful.” In addition to reading, he will offer insight into his #ApoemAday project, where he has been writing and sharing a poem every day for a year via Twitter.